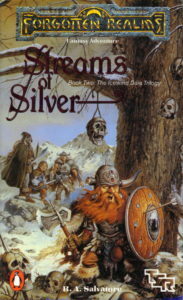 Streams of Silver – Let's Read TSR! With The Crystal Shard a decided success and its supporting character Drizzt Do’Urden generating far more fan mail for its author than the ostensible protagonist, it’s no surprise that this sequel, the second of a trilogy, spends significantly more time on Drizzt than on any of the other characters in this buddy road trip story. This book follows Bruenor Battlehammer as he drags his friends around the northern Realms on a search for his clan’s ancestral home. It’s like The Hobbit, if there was only one dwarf and he had no idea where his home was. To spice things up and avoid drawing too directly from Tolkien, the secondary plot involves an assassin hunting down Regis, the halfling thief. Unfortunately, the two plots are almost completely separate for most of the book, and it doesn’t do the story any favours. Entreri, the assassin, spends nearly the entire plot following just behind the party and doesn’t actually encounter the heroes face to face until right near the end. But since his co-villains aren’t particularly interesting or well-characterized, the time we spend watching them bicker doesn’t really add much to the story. You get some “oh no, what’s going to happen when the villains finally catch up?” sort of tension, but that alone isn’t worth the scores of pages spent on diverting from the heroes’ plot to show what the villains are up to. The answer, alas, is usually “not much.” It would have been a more satisfying structure if the heroes and villains had intersected more than once, rather than having two completely separate and parallel plots, because the B plot just isn’t strong enough. Everything about the heroes’ journey, on the other hand, is just too over the top from beginning to end. They don’t just have a bar fight, they physically destroy the bar and leave people literally hanging from the rafters. They don’t just struggle through a spring storm, they’re beaten to within half an inch of their lives by hail and deadly lightning. They don’t just fight some trolls and run away, they fight ten million trolls and then run away for days. It’s exhausting, in a way, like listening to a story told by a person who can only speak by screaming. Even if it’s a good story, drama fatigue sets in early when everything is the most big and dramatic thing ever. While I understand that epic fantasy should be, well, epic, there’s also a lot to be said for holding back the big epic moments for when they’ll have the most impact instead of just turning everything up to eleven across the board. Still, even though it’s exhausting, you have to admit it’s entertaining. The ending is particularly over the top, where they fight the dragon who drove Bruenor’s clan from their ancestral home. You know, like in that other book where… you know what, there’s not even any point in being snarky about it. I’m just going to come out and say it: this is basically The Hobbit. The leader of a clan of dwarves driven into exile by a dragon takes a long road trip to his clan’s fortress in the company of a reluctant halfling. They get captured and have to be rescued by the sneaky guy, they have to find the secret door into the mountain, there’s a big fight with a pissed-off dragon at the climax, and there’s a bittersweet tragic ending. It’s not a point-for-point rewrite of the original, but it’s definitely a remake in spirit. What makes the unoriginality of the premise more bearable is that Bruenor and his quest are not actually the main focus for much of the book; Drizzt and his nemesis Entreri get most of the screen time. We’re back with the same four J.R.R. Tolkien/Robert Howard-inspired protagonists: Wulfgar the barbarian, Drizzt the drow ranger, Bruenor the dwarf, and Regis the halfling rogue. Regis is about the same as he was in the previous book: greedy and cowardly, but ultimately loyal to his friends. What with the focus being mainly on Drizzt and to a lesser extent Bruenor, though, he doesn’t get as much screen time or development as he did in the previous book. Wulfgar gets to play the wide-eyed ingenue here, gawking at all the trappings of cities and civilization which were unknown to his savage barbarian tribe. He gets a bit of character development with the whole “learning not to hate and fear magic” bit, but mostly his role is still just the big guy who hits things with a hammer. The Hobbit sausage-fest formula gets a bit shaken up with the introduction of Catti-brie, Bruenor’s adopted human daughter, as a full-fledged character. Her arc is a bit odd: captured by a deadly assassin, she’s initially terrified into helplessness, but regains her nerve over the course of the book until she’s ready to go full-on action hero at the end. While I like the gradual character development, the downside is that we spend most of the book watching her do nothing but be dragged around by the villains. Still, it’s good to see a female character who has some degree of agency, cunning, and spirit in a Tolkien-inspired story, even if we have to wait until the very end of the book to see her use it. The aforementioned assassin, Artemis Entreri, will go on to be a recurring nemesis for Drizzt in later novels. (I seem to recall that Salvatore kept having to go to absurd, suspension-of-disbelief-exploding lengths to find ways in which he could be defeated but not actually killed badly enough that he couldn’t come back later.) The idea is that he’s a dark mirror of Drizzt: an incredibly skilled swordsman, but callous, casually murderous, and utterly devoid of empathy. Drizzt sees Entreri as what he could have become if he’d stayed among his people; Entreri sees Drizzt as a waste of potential, a brilliant warrior weakened by his ruinous empathy and emotional attachments. Their conflict is as much a clash of competing philosophies as personal antagonism, and the interplay between the two is perhaps the most enjoyable part of this novel. I like how Entreri is set up as a sort of tragic figure: he’s sacrificed his humanity to hone his skills, and he’s driven to defeat Drizzt to prove that it was a necessary sacrifice, because otherwise he’s lost his humanity for no reason. It’s much more interesting than just leaving it at “he’s a bad guy so he does bad things,” as so many of these books do with their villains. He’s nearly as much of a Mary Sue as Drizzt, though, being a perfect fighter with only just as many flaws as necessary to allow the heroes to defeat him. Unfortunately, as I mentioned earlier, these nemeses don’t actually meet up until four-fifths into the book, which is a long, long time to wait for that payoff. Instead, Entreri spends most of the book chasing after the heroes in the company of some reluctant and distrustful allies. They get little characterization and mostly serve as foils for Entreri so that he gets to demonstrate how ruthless, pragmatic, and deadly he is. When they all ended up dead, I was neither surprised nor particularly bothered; they felt like redshirts from the get-go. The most obvious theme of the novel is racism. Drizzt is a drow, a race of evil “dark elves” who are feared and shunned by civilized society, and now that the party has left the wilds of Icewind Dale, he spends much of the book being feared and shunned. Special mentions go to the scene where he meets the Riders of Nesmé, who have a sort of overdone “hillbillies meeting their first actual black person” moment, and the scene where he’s turned away at the gates of Silverymoon. This is all fine for giving Drizzt plenty of woobie moments of self-pity and self-doubt, but as an analogy for real-world racism it’s pretty rubbish. Part of the reason why real-world racism is so abhorrent is that racist people wholeheartedly buy into negative stereotypes (all black people are drug dealers, all Arabs are terrorists, et cetera) and look at every member of that race through that unrealistic lens rather than seeing them as real individuals. But that doesn’t make any sense in the context of this fantasy world with its black-and-white morality. Imagine a hypothetical Earth where every single Arab person was, in fact, an actual bomb-toting terrorist. In such a world, being afraid of them would be the only sensible thing to do because they’d be blowing people up all the time. It wouldn’t be a matter of “we hate and fear you because you’re a member of this race”; it would be “we hate and fear you because you’re constantly blowing us up.” That’s pretty much the situation with the drow: they’re a race of inherently evil stone-cold killers who only come to the surface to slaughter indiscriminately at the bidding of their terrifying demon goddess. Their hideous reputation, as we’ll see in Salvatore’s later books, is richly deserved. So while we can sympathize with Drizzt’s rejections, we can’t really blame society for being afraid of him. “But he’s a good drow!” doesn’t really fly when non-evil drow are rarer than hen’s teeth. Furthermore, it’s extraordinarily hypocritical. Drizzt’s friends get all indignant when he’s slighted, but they never extend the same sort of consideration to other races of traditionally evil creatures. They meet some orcs early in the book; by the end of the scene, severed orc heads are being kicked around like footballs. Were any of them reluctant anti-villains with a budding conscience? Who cares? They’re orcs, so they’re all bad. Same with the duergar at the end of the book, whom the heroes slaughter en masse. Why should the heroes be surprised that people want to kill Drizzt when they themselves kill creatures which they consider inherently evil without a second thought? Lines of tears wetted Catti-brie’s face. She had felled goblinoids and gray dwarves, once an ogre and a tundra yeti, but never before had she killed a human. Never before had she looked into eyes akin to her own and watched the light leave them. Never before had she understood the complexity of her victim, or even that the life she had taken existed outside the present field of battle. So killing goblins, orcs, duergar, and ogres — all of which are sentient, speaking, thinking creatures — didn’t bother her, but humans are special. Now that’s racism. There’s a lot more left to write on this topic, but perhaps I’ll save it for a later article. The writing in the book is… well, not quite the worst I’ve ever seen in a commercially published novel, but close. He was an elf, and though his skin was black, there remained in his soul a semblance of the harmonic joy of his surface cousins. He wondered how general these feelings truly ran among his people. Did they remain in the hearts of all drow? Or had eons of sublimation extinguished the spiritual flames? No words could they speak above the profound awe that enveloped them. They stood in view of the history of the race of Man within a bubble of timelessness that denied their own perspectives of age and belonging. Seriously. I’m not even working hard to pull these quotes out — the entire book is like that. The diction of both the dialogue and the narration is so overwrought as to verge on parody. Everyone speaks in a stilted, excessively dramatic fashion which has never actually existed in the English language outside of bad novels. Even Ed Greenwood‘s “ye”s and “thy”s, despite their exaggerated tone, felt more authentically English than this sort of amateur thespianism. And coming on the heels of Azure Bonds’ comparatively plain-spoken, down-to-earth characters, it’s incredibly jarring. It’s interesting to note that the first book wasn’t quite as overblown in its style. It feels considerably harder to overlook the faults in the writing here; I’m willing to forgive an author some mistakes in a first novel, but I expect their craft to get better over time, not worse. It also seems to assume a certain amount of D&D knowledge on the part of the reader. For instance, the characters fight a lot of trolls. What does a troll look like? Apparently they’re “lanky”, but that’s about it as far as description goes. It just assumes that the reader already knows what a standard Dungeons & Dragons troll is, which I expect makes the scenes involving trolls rather confusing for fantasy readers who didn’t come to the novels from D&D. On the other hand, the pacing is much better in Streams of Silver than in The Crystal Shard. It doesn’t cram the entire last third of the novel full of huge battle scenes and does a good job of regularly stopping for exposition or character moments in between the action sequences. It’s something that’s been particularly lacking in most of the books we’ve looked at so far, so I’m heartened to see some improvement on that front. It’s not great art. It’s not even pretty good art. The writing is the worst we’ve seen yet, the plot owes much to better novels, and the structure feels awkward. I should be giving it a D. And yet… it still manages to be fun. The characters are sympathetic and entertaining, the plot is enjoyable despite being derivative, and it didn’t feel like a slog the way some bad novels do. So, despite my better judgement, I’m going to nudge it up to a C-. Let’s just hope it gets better from here.